From our humble beginning, Calvary has grown through the Grace of God and the commitment of Calvary’s members. God has been good to us. We have grown from nineteen (19) charter members on January 29, 1939 to over 1,000 members today. We are still growing, both in spirit and in numbers. Calvary began its services in the Presbyterian meetinghouse. The Presbyterian Church met only two Sundays a month (2nd and 4th). Calvary conducted services on the other Sundays. The arrangements worked well and Calvary will forever be indebted to the good will of the Presbyterian brethren. A building program began immediately and a ‘lot’ of land was purchased from the City of Jesup, (April 18, 1939), on the main thoroughfare, in the fastest growing section of town. The ground for the new building was broken with appropriate ceremonies on May 25, 1939. The building was begun of concrete blocks that were manufactured locally at the plant set up for this purpose. In January of 1941, the Baptist Home Mission Board approved the plans of the new building and agreed to advance the church (on a loan basis) the finances necessary for it’s completion. The work intensified. On June 29, 1941 the first services were held in the completed building which is still standing today. An educational building was begun in the middle 1950’s and its dedication was held on September 8, 1957. This building relieved the stress caused by Sunday School and Training Union classes. Calvary had room to grow, which lasted for many years. On August 19, 1981 a lot behind the church was purchased for the purpose of future needs. That need came to a realization and a new Family Worship Center was constructed. 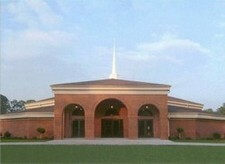 The dedication for this Family Worship Center was held on October 2, 1988. This building houses the social hall, the gym, and Sunday School class rooms. On January 29, 2001 we held our annual homecoming and broke ground for a new worship center. We committed to build this worship center debt free. God has been with us. We realized our dream on November 14, 2004 when we had our first worship service and dedication in the new building.